Aptly named, Blue Ribbon BBQ is hands-down the best barbecue restaurant in the Boston area. Whether it's chicken, pork or cornbread, everything is a winner here with the exception of the limited seating. Many barbecue restaurants have come and gone, mostly due to dried out, tough meats and lousy management. Blue Ribbon barbecue is here to stay, a rare place that has maintained and sometimes enhanced their original vision after several years in business. Go figure that an authentic barbecue joint that would not be out of place in Memphis, Tenn., could find a home in Somerville. The awesome Memphis-style ribs and barbecue chicken make Redbone's a must for barbecue fans, or those who like to overeat. It's friendly, the food is excellent -- including a very good lunch and dinner buffet-- and the atmopshere is free of MSG, gaudy water fountains, Tiki Gods and paper mache dragons that plague so many Chinese restaurants. 948 Broadway (Route 1 north), Saugus. Tel. (781) 233-0077. www.kowloon restaurant.com. The Disneyworld of Chinese restaurants. It is one of the few Chinese restaurants where gaudy water fountains, Tiki Gods and paper mache dragons actually enhance the overall experience. From the Chinese embassy look of the entrance to the multi colored waterfalls, the Kowloon pulls out every Chinese restaurant interior design trick in the book. You would expect the food to be a secondary factor here, but it is quite good, including, surprisingly, excellent Thai dishes. Terrific matzo ball soup, knishes, mile high deli sandwiches, a tantalizing dessert selection and pastrami that rivals New York City's make Joan and Ed's a jewel of a restaurant in the middle of commercial-laden Route 9. They even make a great clam chowder and barbecue chicken! Friendly, personality-driven service and the pride of owners Joan and Ed result in a place people return to again and again. The dense, rich chocolate cake is worth the price of admission alone. The waitresses aren't afraid to voice their opinion on current events, or at an indecisive customer, but that's all part of the charm at Maxie's. A throwback in the most traditional sense, people with personality and many years in the business work hard behind the glass counter, in the kitchen and delivering the meals. The food is what you'd expect of such a hard-working place -- lean pastrami and corn beef, unbeatable knishes, matzo soup and potato latkes, and incredible omlettes.The feeling is reminiscent of the legendary. but defunct Jack and Marion's in Brookline, Mass., where it almost seemed like any race or creed was part of the family. The atmosphere is part of that homey feel at Maxie's, as it could be mistaken as a big, overly-lit basement. Atmosphere doesn't matter in a restaurant, however, when the food is great. Rubin's has a reputation as the best deli in Boston; that reputation is well deserved. Correctly-prepared Pastrami, great corned beef, and other New York-style Kosher deli items make Rubin's the closest thing to the best delis in New York City. There's not much atmosphere here, and the service can be a bit surly at times, but the great deli food overrrides everything else. The S&S Deli won't make anyone forget about the best New York -style delis, but this Inman Square tradition does offer some of the better deli food in the Boston area. That's not saying a lot, but the food is above average and the atmosphere lively. Service is occasionally disinterested and slow, which makes the S&S a borderline recommendation. Ask a Walpole resident about Country Kitchen, and you'll always hear a positive response.Set amidst a world of highly competitive donut chains (one cruelly within view of this Walpole landmark), Country Kitchen Donuts has remained independent and ultimately beloved by local residents and those from outside Walpole lucky enough to make the discovery of a down-to-earth establishment from yesteryear. They offer downright delicious donuts, crullers, turnovers, muffins and New England Coffee within a friendly, know-everyone-by-name setting -- typical for Walpole, a growing Boston suburb that has nevertheless remarkably held on to its small town feel with a hardware store, "townie" restaurants, an independently owned drug store, nice town village green, farms mixed with large neighborhood lots, and 14 percent unused land. Country Kitchen Donuts is the perfect family, trucker and business person's stop. Be prepared for a wait early in the morning, as Country Kitchen Donuts is no longer a hidden secret. The wait, however, is worth it as one bite into the fresh donuts will have you putting the Atkins Diet on hold permanently. 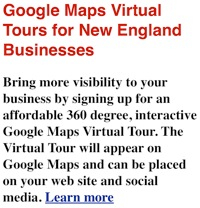 1060 Main St. Millis. Tel. (508) 376-8999. A fun, brightly lit modern 50s style diner with booths ample counter space and a very large jukebox, Budabing's makes superb breakfast, lunch and dinner. The menu is huge, including great barbecue chicken, pizza (the brick oven type), shepherd's pie, meatloaf, turkey dinner and a mixed green salad with chicken, steak and shrimp. 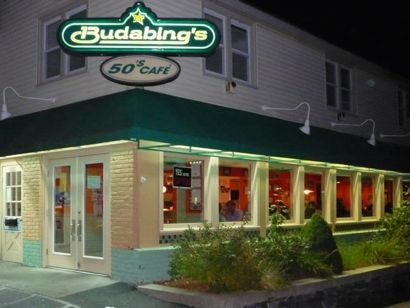 Budabing's is one of the great values on this earth, with excellent food to match, making it a local favorite and a viable alternative to cooking at home. Located in a basement across from Dedham District Court, the Courtyard Cafe is a favorite restaurant amongst lawyers, jury duty people and hot shot professionals with cell phones surgically attached to their ears. The wide breakfast and lunch selections (with nice pesto, olive oil and garlic flourishes) make the Courtyard Cafe a comfortable, delicious discovery in a charming-tree-lined, old colonial home section of Dedham center. The Mediterranean paninis on foccacia are especially appealing. 149 Turnpike Rd. (Route 9), Westboro. Tel. (508) 366-8302. Harry's Restaurant and Dairy Bar. Harry's Restaurant and Dairy Bar looks out of place on commercial Route 9, but that's a good thing. On a road where you can purchase everything from microfiber sofas to cell phones that do everything except recite the Declaration of Independence, Harry's Restaurant and Dairy Bar bucks every trend by sporting an old-fashioned "Drive-in....Ice Cream...Fried Clams" sign out in front of a small, worn out looking diner-type building.The minute we saw that old-fashioned "Drive-in....Ice Cream...Fried Clams" sign out front on fast-paced, modern Route 9, we knew there was something special going on inside this vinyl palace that serves breakfast early in the morning and dinners past midnight. What we found was something beyond the hearty eggs and substantial club sandwiches expected of this genre -- in the kitchen resided a culinary genius with sophisticated leanings. We found it fascinating that someone who could turn out delicious New England diner standards like full-bodied fried clams, pancakes and tuna melts could also create delicious pesto-stuffed salmon, crab-stuffed haddock, steak house-quality baby back ribs and Boston North End-caliber pastas -- chicken and broccoli alfredo, and chicken marinara to name a few. 49 North Washington St., North Attleboro. Tel. (508) 643-4141. Mackie's Restaurant and Country Store is the kind of restaurant you could take home to mother. Old-fashioned and sweet, Mackie's is full of charm, character and graciousness. Mackie's has it all -- breakfast, lunch and dinner. A menu highlighted by "Mom's special of the week" added to our feeling of being right at home in this family-oriented establishment. Mom's special," a turkey dinner with all the fixings tasted fresh and was plentiful -- something you would expect from your grandmother many years ago. The tender and flavorful steak tips were perhaps the best we've sampled, close in quality to the famed Newbridge Cafe in Chelsea, Mass. Homemade cooking while dining out just took a turn for the better, thanks to the Medway Restaurant located in a strip mall on Route 109 in the pleasing southwest Boston suburb of Medway. Looking as nondescript as the Seinfeld restaurant hangout, the Medway Restaurant may look ordinary on the outside but inside the food is extraordinary at this warm, inviting eatery with a classic long counter and plain, old booths. The menu states your hostess is Lula, which is, thankfully, 100 percent accurate. Lula and staff work seemingly day and night to create food that might not even be matched by the proverbial culinary genius known as grandma. Whether it's Greek-American (the homemade baked lamb and moussaka specials are the best we've ever sampled), Italian, seafood, steak, chicken, burgers, onion rings, a hearty breakfast or a delicious pie, the Medway Restaurant defies the old adage that you can never find a good restaurant in a strip mall. It is simply one of the best "cheap eats" restaurants in the suburban Boston area. It doesn't take a genius to figure out that the Mug and Muffin specializes in coffee and muffins. Both are done well here in a long, dimly lit family-style, traditional dining room that brings back memories of the former New England-based Pewter Pot chain. Besides muffins and coffee, the Mug and Muffin does many things well, such as great hearty eggs and pancakes, club sandwiches, excellent tuna melts and tasty burgers. Located in revitalized Norwood Center, the Mug and Muffin may not be as eclectic as some of the newer, shinier downtown offerings, but it does have time on its side -- a place where the waitresses are polite, the atmosphere informal and the food done just right. 679 High St., Westwood. Tel. (781) 461-2440. Twenty-something restauranteur Victor Servello has created a masterpiece of a restaurant, quite possibly the best we've tried in Norfolk County. Located in the former Newport Creamery and Bergson's Ice Cream storefront in an unassuming Route 109 strip mall, Vello's has instantly become a local favorite by serving delicious, oversized sandwiches and creative dinners worthy of the best of Boston. Try the oven baked salmon with bacon mashed potatoes and seasonal steamed veggies and you'll be amazed by its tender and flavorful presence -- all for under $13.00 (includes an excellent mixed green salad). The hot pressed turkey and pastrami sandwiches cry out "New York, New York!" and the pizzas rival the freshness and innovation of Boston's best-known North End establishments. The clam chowder lets it be known that you don't have to travel to Maine to get this traditional taste of New England -- it's the thickest and most flavorful we've ever sampled. The fresh tomato bisque is not far behind with its smoky flavor. Deserts are absolutely amazing ranging from the authentic teramisu to the wide variety of great ice cream -- the coconut stands out. Vello's is small inside -- sort of like an elongated and somewhat sophisticated luncheonette. Vello's also serves breakfast on the weekend. The coffee is always great! Service is attentive, as Servello has chosen a young but thoroughly professional and interested staff. If there was a restaurant hall of fame, the board of directors would waive the five year waiting period for Vello's as their universal appeal and commitment to excellence is a model for the way a restaurant should be operated. 165 Endicott Street at The Liberty Tree Mall, Danvers. Tel. (978)777-1290. www.kellysroastbeef.com. If Kelly's Roast Beef has what is considered the best clam plate in New England, then why do so many of us eat the accompanying onion rings first? A thoroughly valid question first raised during our youth - and perhaps a contributing factor in why none of us ever met women at this Revere Beach, Mass., food-stand, seaside location -- Kelly's has served the most mouth-watering onion rings for decades. Not too dry and not too greasy, the onion rings have that melt in your mouth quality that has you coming back for more within the week. There's also enough of those fried gems to meet your entire caloric intake for the week. That coupled with the fabulous clams, or an unparalleled tender roast beef sandwich, however, results in an instant induction into the Visiting New England.com comfort food hall of fame. There's nothing quite as good as a home cooked meal, and that's why people always return to Andros Diner. More of a small restaurant than a diner, this long-time favorite near the Waltham line is family-run and family-friendly. The meals are amazingly consistent, with the moussaka, lamb dishes, lemon soup and Greek salads finishing at the top. Service is quick and sometimes brusque, but, in the end grateful that crowds come to its small, informal dining rooms. 60-64 Mt. Auburn St., Watertown. Tel. (617) 924-9660. You don't go for the atmosphere. You go for the delicious baked lamb, kebobs rice pilaf and other great Greek offerings at this long time favorite with a stellar reputation. 300 Washington St. Wellesley. Tel. (781) 235-9647. An old world atmosphere, friendly prideful service, a charming carpeted dining room and great Greek dishes --as well as basic lunch and breakfast specialties --have made the Maugus a favorite for gernations. Dining at the Maugus is like eating your favorite relative's old home on a Sunday afternoon where the flavorful aromas complement a family get together. 149 Great Rd., Acton. Tel. (978) 266-0222. Other locations in Portland, Maine, Falmouth, Maine, and Portsmouth, N.H. O'Naturals. At last, a health food restaurant that doesn't serve cardboard-tasting entries. Stonyfield Farms (organic yogurt) CEO Gary Hirshberg has brought a visionary approach to healthy fast food at his newest healthy endeavor, O'Naturals, by bringing in chefs to expertly mix the organic with flavorful selections. All sandwiches are made with flatbread (organic, unbleached and unbrominated flour with germ, honey sea salt, olive oil and yeast with a sourdough-like taste). Ample selections such as pesto chicken, wild prairie raised bison meatloaf and wild Alaskan salmon with a pan Asian marinade are simply fantastic, raising the question : why go anywhere else for lunch? Add to the sandwiches fresh root vegetables, organic goat cheese, organic hummus, fresh red peppers, sharp cheddar cheese (maybe not on the salmon) and you have an entree competing for the top spot in Boston dining -- the more expensive establishments included. Tossed salads are also delicious, as are the Asians noodles and soups (carrot ginger, butternut apple squash, Maryland crab, cream of asparagus. etc.). Highly recommended for dessert are the incomparable and very large chocolate chip cookie and chocolate brownies. Delicious organic flatbread pizzas are served after 4 p.m. , and coupled with the delicious salads, soups and sandwiches, make for a great casual and inexpensive dinner. O'Naturals also takes in account the fussy child who can only eat macaroni and cheese or grilled cheese -- they have both, as well as a turkey sandwich that could make a believer out of children previously not wanting something so "fowl." To further enhance a child-friendly zone, O'Naturals offers a delicious organic soda fountain and a play area with a couch included. Service is always fully functional and the atmosphere is earthy without being pretentious and elitist. The unfinished concrete floors, light wood tables, recycled wall materials and bookshelves make for a natural, comfortable setting. Pricing is reasonable with most entrees under $7.00 -- remarkable for the high quality of food available. If you think of health food as something boring served by preachy, long-haired, ironically unhealthy looking people, think again. O'Naturals has landed as a superb 21st century restaurant dedicated to friendly, prompt service and some of the best food in the region. You'll feel healthy coming here again and again. 743 Washington St., Newtonville. Tel. 1-617-964-9200 / -617-965-0909. www.cabots.com. Even if Cabot's had the personality of an organic breakfast cereal, it would still be worth going to -- the ice cream is that good. To add to that high quality ice cream, however, is an old-fashioned ice cream parlor setting with exposed brick walls, cartoon-like lighting, fun wall memorabilia, soda fountain-type stool seating and a friendly staff adept at conversation, humor and an affinity for children, as well as well- behaved adults. Top ice cream choices include cherry vanilla (absolutely loaded with cherries), a pungent ginger, and the best mint chocolate chip sampled, to date. Cabot's also serves more than adequate food including turkey dinner, great burgers and a fine clam chowder. The eternal crowds add to the fun atmosphere, but can create waiting lines. Don't leave, however, as you will surely miss instant memories of a great ice cream parlor that offers some of the best ice cream in the Boston area. At last, a 1960s-like family-style restaurant that reminds me of my favorite childhood places -- large tiled dining rooms, booths, counters, the smell of coffee brewing, burgers, hot dogs and out-of-this world ice cream. Bliss Brothers actually supplies ice cream to many local businesses including some ice cream stands that don't make their own ice cream. Bliss Brothers has a take-out section that includes a viewing window where the ice cream is packaged and its milk bottled. An old Bliss Brothers milk delivery wagon is also on display. Bliss Brother is a great place to go alone and read the paper, or as part of a large group wanting to sample some very good comfort food. It's like a huge Friendly's with better food and ice cream (not that there's anything wrong with Friendly's; Bliss Brothers just raises this type of restaurant to another level). 109 Salem St., Boston. Tel. (617)523-0990. www.aldenteboston.com. Perhaps the best representation of traditional (and some contemporary) Italian food in Boston's North End, Al Dente lives up to its "authentic Italian cuisine" billing. Drawing from from all regions of Italy, the chef has a mastery of concocting incredibly fresh Italian fare. A "must- try restaurant" when visiting New England. The Chicken Marsala is a must-try with its flavorful chicken, ham and mushrooms in a wine sauce. Al Dentew is perhaps not a true "cheap eats," but the type of food served here would be much more expensive at other places, therefore, making it a great deal. 821 Mt. Auburn St., Watertown. Tel. (617) 491-0122. Huge portions, low prices, lines outside the door and such dim lighting that you can't read the menu. Old time waitresses and comforting and plentiful pasta entrees create the appeal that keeps the faithful coming back. Route 1A, Walpole. Tel. (508) 660-1533. Located in a nondescript shopping center, Guido's has that family-run feel, a great revolving glass case of desserts, oldies music playing on the radio and enough food to serve the entire town of Walpole. The gnocchi with spinach and mushrooms is particularly good and the parm dishes are frequently consumed. Friendly, informal and reasonable priced, Guido's certainly fulfills the need for good Italian food in the southwest suburbs of Boston. 1733 Massachusetts Ave., Lexington. Tel. (781) 861-1182. Upper class Lexington can sometimes seem like its own exclusive republic, but Mario's has survived the growing elitism of this western Boston suburb. Well-prepared baked ziti, eggplant parm and pasta, it appears, can survive anything. Mario's always seems crowded and its small but pleasant dining room creates a waiting list. Once you sit down at the formica table and sample the Italian fare, you'll be glad you chose Mario's over the surrounding trendy coffee and sandwich places that charge a fortune for virtually nothing. Mario's, on the other hand, serves lots of food, really good food at low, low prices. 48 E Plain Street, Wayland. Tel. 508-653-8570. A great, meaty lasagna and some very fresh pizza highlight the menu at this moderately sized dining room with plenty of booths and lots of families. Suprisingly, the Villa serves some of the best steak dishes around, but it's the pasta and sauces that have been around forever and with good reason: it tastes just like the food your Mama used to make. Unless your name is Melvin Kaputnick. You'd be hard-pressed to find a better burger in this Harvard Square college student hangout that could best described as a dive. Since 1961, herds of people have been chomping down on the great burgers. Service can be testy and sharp-tongued. On the right day, you can be called captain, lieutenant or chief. 131 Sherman St., Cambridge. Tel. (617) 354-0335. Jose's is a hole-in-the-wall near the Fresh Pond region of Cambridge that serves some of the best -- and most abundant -- Mexican-American food in the area. There are so many phony Mexican restaurants out there, focusing on Americanized versions of true Mexican food, but fortunately places like Jose's come to save the day. 71 Arlington St., Watertown. Tel. (617) 924-4100. So many restaurants making rotisserie chicken get it all wrong -- the goal is to not make greasy, lightweight chicken doused in sorbitol, MSG and other bad chemicals. The Ararat Restaurant in Watertown, Mass., negates this "fowl" trend by coming up with the best full-bodied rotisserie chicken we've sampled since being introduced to it in 1993. With a hint of lemon and an always perfectly cooked, tender taste, this is major league rotisserie chicken. The secret to its success resides in the hands of Avedis and Seta Najarian, a prideful couple working hard every day to make the best Amenian gourmet food in the area. They succeed in flying colors with the rotisserie chicken and other winners such as falafel plates, losh kebab, lahmejune and kibbe, to name a few. There is limited seating at this small unpretentious, homey storefront located near the Arsenal Mall. 4 East St., Walpole. Tel. (508) 660-6700. Great Greek-style pizza, plus excellent kebobs and gyros dinners, highlight this spotless, friendly, appealing small restaurant in pleasant East Walpole. There's always a smile, quick service and steady business. The circular dining room with nice overhead lights and big windows offer a nice alternative to the typical house of pizza setting. New London's greek style pizza is addictive. It's greasy without being too greasy and has a most compatible marriage of flavorful cheese,tomato, ample toppings and thick crust. It's a fact that people eat New London pizza really fast because they don't want to spend a second not tasting the memorable pizza. The best combination is hamburg and green pepper. New London has a small, clean dining room overlooking the attractive Concord Depot train station. On a side note, we once saw historian Doris Kearns Goodwin take out some pizza from New London. Maybe New London's legendary pizzas will make its way into one of her history books. Unforgettable gourmet style Italian pizza, with an accent on truly fresh ingredients. The roasted roma tomatoes are worth the price of admission alone. One slice is enough to fill the appetite, whether it be sausage, eggplant, spinach or any of the superb combinations. Legendary and still great, the Italian-style brickoven recipes haven't succumbed to suburban expansion. The service can have a little attitude and the atmosphere is rather plain, but none of that matters at this special Massachusetts landmark. While there have been a plethora of brick-oven pizza places opening in the region, none can quite duplicate the exquisite (can we use that word describing pizza?) pizza at this stellar North End eatery. Route 1 Southbound, Saugus. Tel. (781) 233-9950. www.princerestaurant.com. The Prince Restaurant stills stands tall, with the exception of the "Leaning Tower of Pizza," a humongous structure on top of the restaurant emulating Italy's Leaning Tower of Pisa. We recommend the tangy margharita pizza, which isn't on the menu. The Prince still offers some of the best pizza served by truly great people. I remember with fondness former owner Arthur who took care of us like we were first family. Perhaps your children will experience this fun place. You can't get any more "Boston" than Santarpio's. Located adjacent to the underside of the Southeast Expressway in the heart of a great East Boston Italian neighborhood, getting there is half the fun. It's not uncommon to drive around the block 10 times before finding a parking space. It is also not uncommon to be sworn at by passing motorists who know how to drive the block faster than you. Once you're there, prepare yourself for the best pizza in Boston, and arguably, in New England. Frequented by television anchors, local politicians, personality driven tell-it-like-it-is neighbors, an army of platinum blondes, hungry families looking for a bargain and everyone else who grew up in Boston and the surrounding area, Santarpio's is not a pretty picture from an atmosphere perspective, but the pizzas are indeed circular Picassos. 370 King St., Franklin. Tel. (508) 520-7900. Marc Bluestein has brought an organic flair to this pizzeria/creamery. From the delicious mixed greens salads to mouth-watering floatboard pizzas and homemade ice cream, Spruce Pond Creamery is an affordable delight, unlike any other place in the region. Organic cheeses, non-nitrate pepperoni and great toppings and mixes like pesto, red peppers, shrimp and goat cheese make you realize that this is a very distant cousin of your basic house of pizza. All the ice cream is superb, but the raspberry chocolate truffle is the absolute standout. Decor is colorful with multi-colored fans, clean-tiled floor, and an outdoor section overlooking pretty Spruce Pond. The open kitchen with a wood stove oven has a certain charm. Organic food-lovers and those about to discover the wonders of Bluestein's fresh new concept of introducing a healthful style to conventional foods, bring your appetites! 1119 Washington St., Stoughton. Tel. (781) 344-2030. Town Spa has been spinning truly great thin crust pizza since 1956. Two big dining rooms are just about as busy as Stoughton Center, but fortunately a competent, largely experienced wait staff wastes no time bringing out the graceless, almost pastry-like pizza. Town Spa is a great place to eat pizza while watching usually sporting events on the large screen televisions. Cambridge Common, 1667 Massachusetts Ave. Tel. (617) 547-1228. Cambridge Common seems to please everyone from the most liberal Harvard University college students to the most extreme blue collar types. They all have one thing in "common"; they know a good bargain when they see one, as Cambridge Common offers a wide variety of lunch and dinner items at reasonable prices in a dark, cavernous setting. Particularly good is the curried chicken wrap -- tangy, substantial and addictive -- and a wonderful meatloaf dinner. 1920 Mass. Ave., Cambridge. Tel. (617) 876-9180. If Christopher's was a politician, it would appeal to conservatives and liberals alike. Vegetarians, meat eaters, families, drinkers and dessert lovers can find joy in high quality dishes. Service is pleasant and the atmosphere is agreeable in its comfortable informality. This is the real Applebees, a place in the neighborhood that continues to excel to all types after all of these years. Set in a house with a tiny sign within a residential neighborhood, the Colonial House is charming on the inside with a roaring fireplace (useless in the summer though) and food that won't roar through your digestive track. From homemade meatloaf to delicious calimari, the Colonial House is a local favorite offering affordable and tasty steak, seafood and chicken dishes. The crowds hint that this is a great place to eat. 3484 Washington St., Jamaica Plain. Tel. (617) 524-2345. www.doylescafe.com. The ultimate Boston Irish pub since 1882 is a favorite amongst woking class blue collar types, yuppies and politicians. The large, cavernous rooms accommodate those who like to drink beer and tell great stories in sharp Boston accents. The food is decent, offering the usual chicken, steak and seafood dishes, along with pizza. 650 Washington St., Chelsea. Tel. (617) 884 0134. Newbridge may lead the pack in lack of atmosphere, but this bar-like dive is legendary for its amazing steak tips. Newbridge offers a lot of food for the money, which has made it a cheap eats favorite for locals and those outside of the region who know a good bargain when they see one.